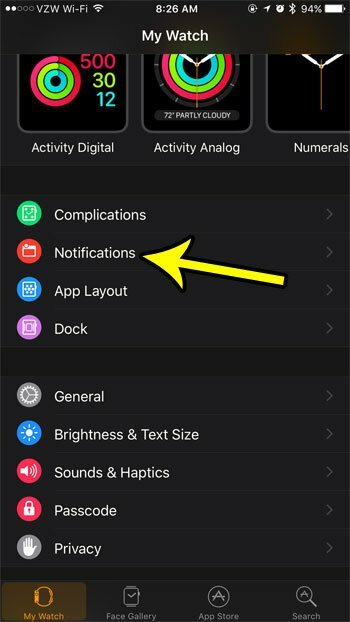 The ability to receive iPhone notifications on your Apple Watch was one of the biggest draws initially for me when I was considering purchasing it. I usually carry my phone in my pocket, mainly taking it out occasionally to check if I had any new text messages or missed calls. The Watch makes it so that those alerts and notifications are visible on the watch face instead, allowing me to leave my phone in my pocket. Of course there are a lot of other things that make the watch a great device, but that notification interaction sure is helpful. Unfortunately some of the notifications that you receive might contain personal or sensitive information that you may not want others around you to see. The convenience of displaying your iPhone notifications on your watch means that anyone nearby can read them almost as easily as you. 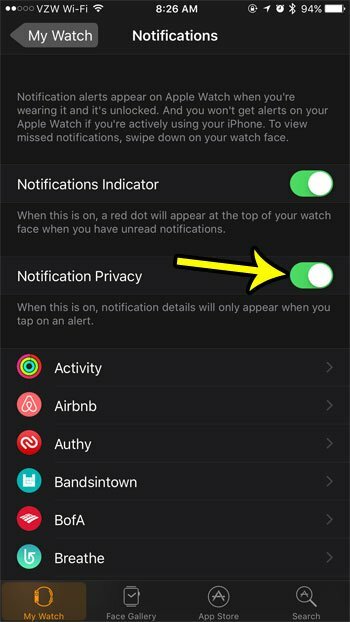 Luckily there is a setting in the Watch app on your iPhone that will add a bit of privacy to these alerts. Our guide below will show you where that setting is found. The steps in this article were performed in the Watch app on an iPhone 7, in iOS 10.3.3. The watch being modified is an Apple Watch 2 using the 3.2.2 version of WatchOS. Note that this will not stop alerts from appearing on your watch. It will only hide the details of that alert. This does not affect alerts or notifications on your iPhone. Step 2: Touch the My Watch app at the bottom-left corner of the screen. Step 4: Tap the button to the right of Notification Privacy to enable that setting. Did you know that you can take pictures of your Apple Watch’s screen that you can then share with others? Learn how to enable screenshots on the Watch and create pictures of the watch that will save automatically to the Photos app on your iPhone.